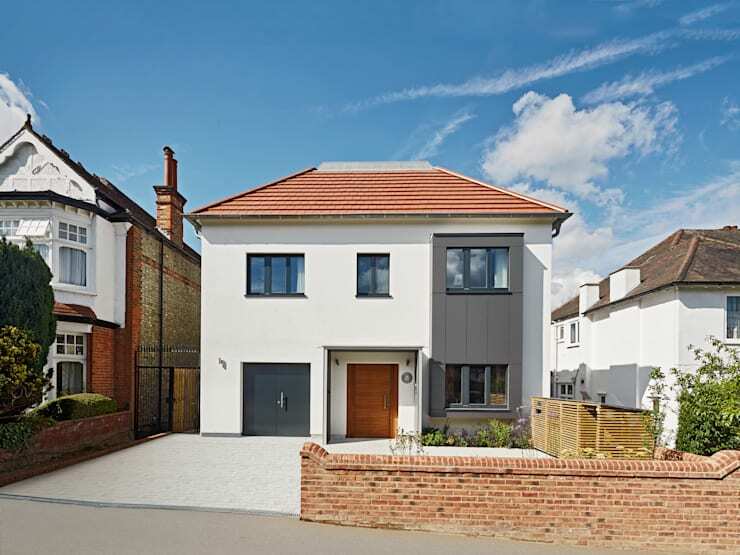 Today we will look at a home situated in the suburbs of North London, but which is much more than your standard suburban house. At first glance the house does not seem that different from its neighbours, but you will soon see that this residence offers a healthier, more stylish and more economical alternative than its contemporaries. The architect behind this unassuming project is Baufritz Ltd., located in Cambridge. 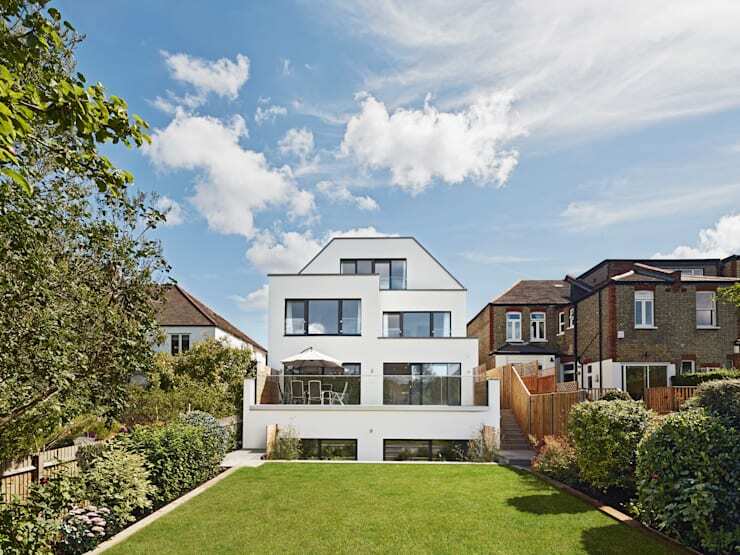 This is a company which is well-versed in the art of architecture and home design, and their wealth of experience can be seen expressed in the impressive modern home we will inspect here today. So, if you, like so many other, believe that suburban homes can only be boing and one-dimensional, we urge you to join us in looking at a contemporary suburban residence that will exceed your expectations! Here is our first glance of the North London home. As we can see from this image, the house has a standard street elevation which is nothing peculiar for such a conservation area. The house is markedly in the same style as its neighbours, box-shaped with the traditional shingle-covered hip roof. It even has a traditional brick fence at the front of the property. Not that there's anything wrong with this traditional style, it is just not anything remarkable for our day and age. If we walk around the property to the rear of the house, however, we soon find a very different sight. The back of the house is touchstone of modernity that looks entirely different than the street view we just saw moments before. The geometric volumes that make up the building fit into one another like puzzle pieces, and the ensemble fits into the outline of the facade we saw before. This is a clever piece of trickery, but the home's true form soon reveals itself unmistakably. Baufritz made use of their own prefabricated timber frame in the construction, saving the owners a load on construction costs. Furthermore, it also allows for outstanding energy performance and is held to exceptional construction standards. Moving inside the house, we are greeted by a distinguished contemporary hallway. On the ground floor from the street view we saw in the first image, the foyer allows access to the private bedrooms upstairs, the public spaces on the ground level, and the basement space, which we will inspect later on. It is worth it to pause for a moment and note the materials used in the interior of the home. In a primarily neutral colour scheme the composition had been well-planned and considered. 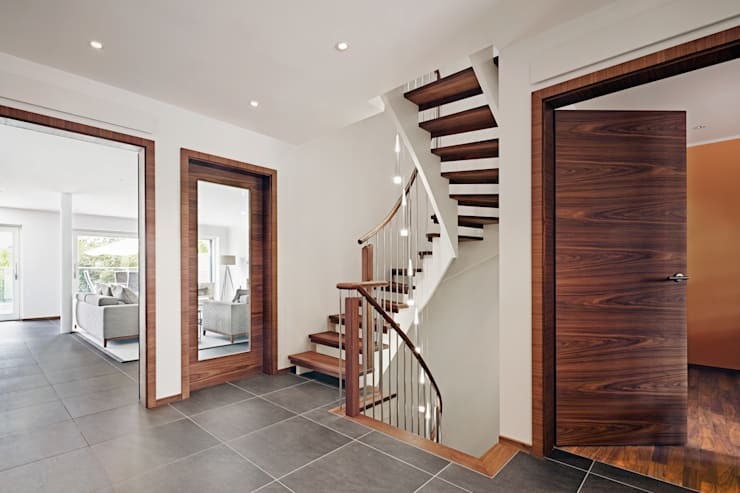 The large, grey stone tiles provide a pleasant contrast to the white walls and ceiling, which in turn is complemented by the wooden doors, frames, and stairs that punctuate the whole picture. Now to the master bedroom of the house. This room is located on the top-most floor of the room, taking up this entire level, in fact. It is nestled under the hipped roof we saw in the second image, and also hosts its own private terrace. To the right of this picture, we can see that the windows opening up onto the private terrace take up the entire wall, ensuring that the room can always be filled with natural light. The colour used inside compliments this, as it is a very light off-white that should reflect light and expand the perceived perimeter of the space. 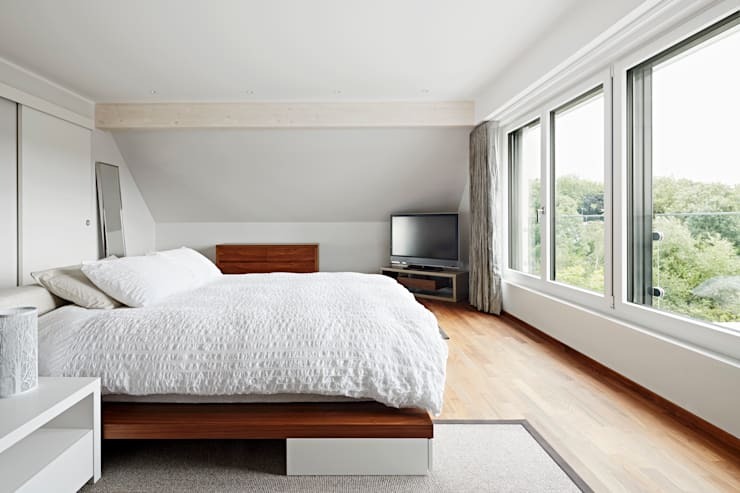 The furnishings are simple, yet elegant—all you need for a restful and serene atmosphere! If we move from the very top level, where we found ourselves in the previous image, all the way down to the basement, we find a delightful family games room. Going underground is a great way to create more space on a property of limited dimensions, and by this method you can always add another room which you desire. 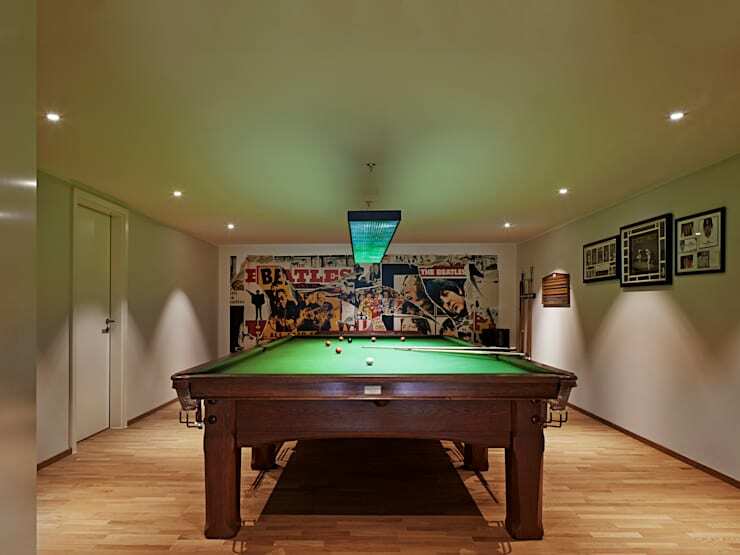 This games room is inhabited by a large snooker table, allowing for endless hours of entertainment for all ages, as well as quality family time. The back wall of the room is decorated by a nostalgic collage, appropriate to the spirit of the room. We finish off our tour of the Baufritz home in London with the guest bathroom. Now, we are quite sure that anyone who visits this restroom cannot leave without being significantly impressed. The modern bathroom is decorated by a very special wall, which we can see here at the back of the image. 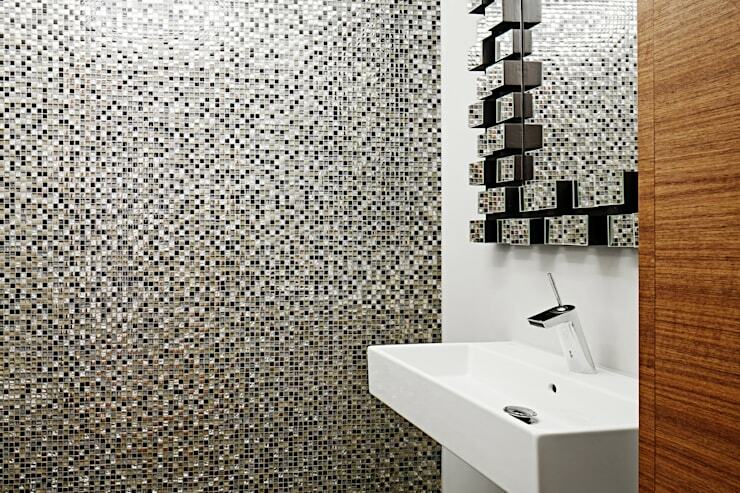 Small glass tiles in black, grey, and white fill up the entire wall in a collage. The resultant effect is a sparklink wall that looks almost like a waterfall of glitter. The effect is echoed in the mirror frane that hangs above bathroom sink. Here, however, the spectacle is taken a step furter with raised blocks of the frame. It is certainly a feature bathroom, and if that's the type you're looking for yourself, take a look at some more: Fancy bathroom ideas! What do you think about the use of materials in this home?